the fragrant olive oils and herbs of Provence. In the hands of the master chefs of the Riviera, ordinary ingredients are transformed into a thing of wonder, leaving the diner a little dumbstruck—even a little changed— by their incredible culinary experience. 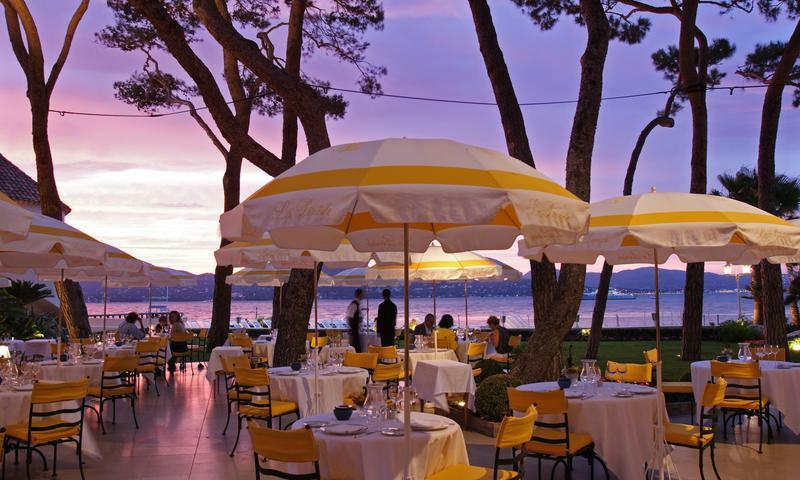 Here are the 6 top restaurants of the French Riviera to visit. 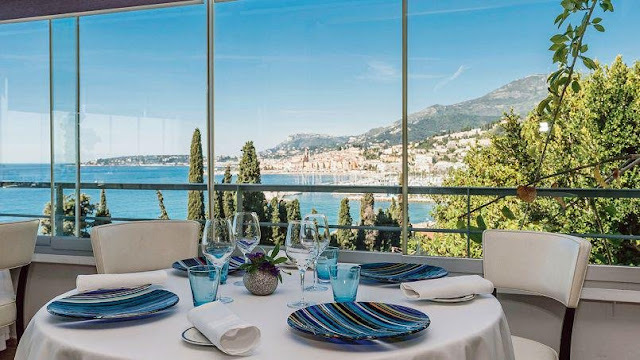 Recently voted the 4th best restaurant on the planet, Mirazur is set high up on the coast in desperately pretty Menton, with enchanting Mediterranean views from its elegant and light-filled dining room. Chef Mauro Colagreco draws on his Argentinean-Italian heritage to create haute-cuisine of incredible delicacy, using fresh local produce plucked daily from the sea, nearby mountains, and Mauro’s own extensive garden. Expect refreshing, surprising combinations, like blue lobster in a fragrant chamomile broth, and roast pigeon with fresh strawberries and sticky pigeon jus. For those who like to interact with the chef to elevate their dining experience, Mirazur cannot be beaten, as Mauro often stops at tables to chat with diners, and the atmosphere, while undeniably high-end, is relaxed and cheerful. This is a place to settle in for a tasting menu in a dreamy setting and be surprised and delighted by some of the best cooking in the world. This outstanding 2 Michelin star restaurant is perched at the dizzying edge of sky and sea, the view dropping away to the cobalt-blue Mediterranean 1400 feet below, along the vertiginous coastline and on out to Corsica, floating like a cloud in the distance. Everyone who has imagined themselves on the Riviera in the summertime has probably dreamt of a meal in a place like this. If you can drag your eyes away from the view, you’ll discover a menu of incredible beauty and execution, led by Arnaud Faye, who has collected Michelin stars like confetti during stints as head chef at the Ritz, Mandarin Oriental, and the Auberge du Jeu de Paume. 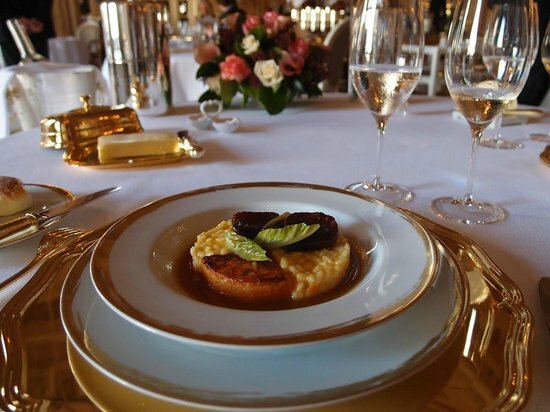 The meals at Chevre d’Or are refined and elegant, featuring sophisticated French culinary techniques and celebrating the finest produce of the region with delicacies like foie gras with peach cream and smoked lobster with melon. 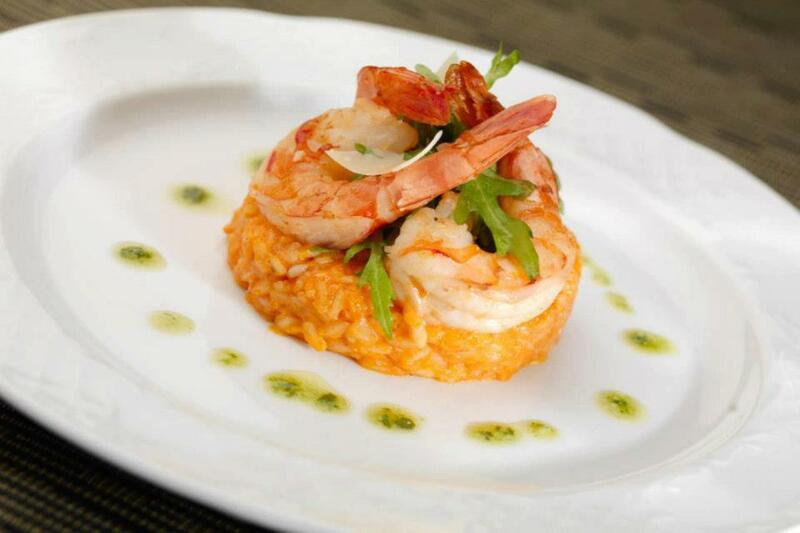 The dining room is just as refined and elegant, with a pleasantly formal feel that is rich in occasion. After the meal, take a walk in the cascading garden terraces that hover over the sea, drinking in that sublime, heart-stopping view. There are over a hundred restaurants in the world with three Michelin stars, but even among this rarefied crowd of megastar chefs, one name stands out as a bastion of class and impeccable cooking: Alain Ducasse, and his flagship restaurant, the Louis XV Alain Ducasse. In 1987, Prince Rainer II of Monaco challenged Alain Ducasse to open a restaurant in Monaco’s iconic Hotel de Paris hotel—and what’s more, he declared it must win three Michelin stars within 4 years. Less than 3 years later, the Louis XV Alain Ducasse won its 3 stars, and has not lost a single one since. The food—refined, beautiful, and delicate— is a triumph of haute cuisine done simply, while the lavish décor of the dining room nearly beggars belief, with vaulted ceilings, cherubic frescoes, vast chandeliers and marble columns. The dining experience here has been likened to eating at the ornate palace of Versailles, although a 2015 redesign has added some modern features. Not all are convinced of the improvement, yet what is rarely (if ever) faulted is the presentation and finesse of Alain Ducasse’s menu, which continues to astonish even as the decades pass. It says rather a lot that this restaurant set in a pretty white cottage on the far curve of the Bay of Angels is one of Alain Ducasse’s favourite restaurants on the French Riviera. Specialising (nay, focussing entirely) on seafood, Restaurant Le Bacon has been run by the Sordello family since they started serving up tuna nicoise sandwiches and lemonade from their rustic shack by the sea over 60 years ago. Le Bacon has become considerably more fancy since then. 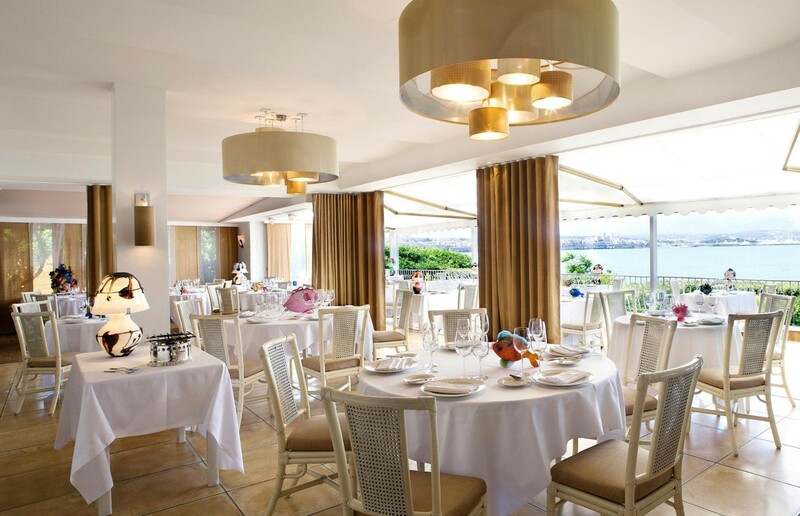 Today, diners in the elegant, breezy dining room and terrace can look out across the garden to the yachts and the distant old town of Antibes, enjoying meals of ravioli of sea bass and truffles, grilled langoustines, and delicately poached red mullet— as well as what Ducasse has called the best bouillabaisse on this stretch of Riviera. And if Alain Ducasse tells you to try the Bouillabaisse, then this is what you do. 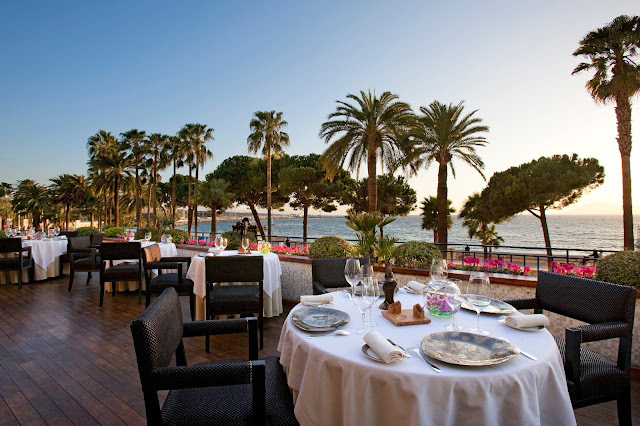 The most illustrious restaurant in glittery, swanky Cannes is undoubtedly the Palme d’Or at the Hotel Martinez, which was awarded two Michelin stars in 1991 and has held them with distinction for the intervening 26 years. Head chef Christian Sinicropi presides over a sublime menu of French gastronomy, themed rather hyperbolically around philosophy and ‘movements’, but delivering a superb culinary experience where it matters, on the plate. Again, the magnificent dining setting only adds to the richness of the dining experience, with a stunning black and white themed dining room that harks to cinema’s glory days, and a simply stunning terrace with views across the Croisette to the yachts skimming their way across the sparkling Mediterranean. A beautiful spot for lunch, an exquisite one for dinner, when the ethereal pink twilight fades and the lights start to twinkle across the French Riviera, and yet another course of startling deliciousness appears on the white tablecloth before you. Our culinary tour of the Riviera ends at Saint Tropez, where Chef Arnaud Donckele presides over the only other three Michelin-starred on the French Riviera: La Vague d’Or at the Hotel de la Pinede. Donckele trained under Ducasse and was awarded the coveted ‘Best Chef of the Year’ accolade in 2013 at a mere 35 years old. This is a man at the top of his game, and the menu delights the senses with its decadent French gastronomy- blue lobster, guinea fowl, truffles and foie gras. The restaurant is set in a beautiful chateau hotel, surrounded by the tall shady pines that give it its name. The dining room is undeniably splendid, but the summer dining terrace has a view across the Bay of Saint Tropez that could break your heart, as the distant mountains turn dusky blue under the dreamy pink skies of sunset, and the sea shines burnished gold. 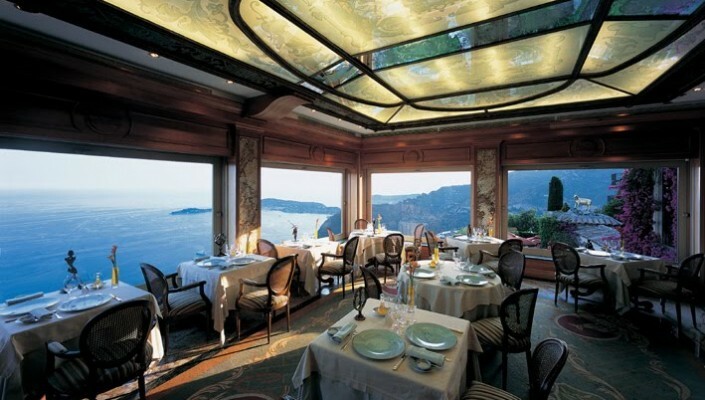 As a setting for a one of the great meals of your lifetime, it’s very hard to beat. Your gourmet journey along the Riviera does not have to stop there, with a dazzling range of world-class restaurants still to be discovered in the flowery hill villages and along the Cote d’Azur’s palm-lined boulevards. Hotel Negresco’s Chantecler in Nice, Paloma in Mougins, and Hostellerie Jérôme in La Turbie certainly deserve special mention. Yet those with a private chef onboard their luxury yacht charter will no doubt want to leave some room in their schedule for elegant meals on deck anchored off the Cannes Islands, Cap Ferrat, and the lush island paradise of Porquerolles, before cruising on to the next destination, and the next world-class restaurant.